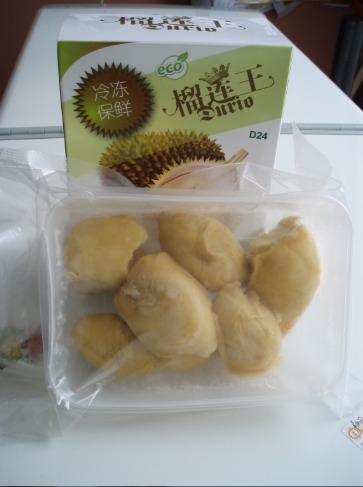 MEDISTEM SDN BHD (828083-T), the first exporter of frozen durian to China brought the first shipment to China during the World Expo in Shanghai in 2010, to very enthusiastic response from Chinese consumers. Now with Premier Wen Jiaobao’s official visit to Malaysia to make it officially possible to have frozen durian enter the China market, Chinese consumers can now enjoy this special fruit from Malaysia, right at home. The best Malaysian durian are now processed, quick freeze and packed into 500 gms boxes at -30 degree Celcius and stored at -18 degree Celcius. These frozen durians are handled in China by one of the largest cold chain fruit distribution company, Xingyeyuan Dalian Fruit Distribution Company who services some 600 large supermarket chains in China. For resellers and distributors interested to obtain frozen durian, kindly contact us direct in our office in Kuala Lumpur. hi! may I know here is your durians available now in China? I have buyers in Hangzhou city. How can we discuss further? Show your email and mobile so we have Peter or Darryl to call you. I have interested buyer in China, please advice.